Calgary Zoo Whooping Crane “grandchick” makes history in Louisiana! Great news! This spring was a special one for whooping crane recovery efforts in North America. Since 2011, an international team of conservation biologists has been working to reintroduce a non-migratory flock of whooping cranes to Louisiana – an area the species disappeared from in 1939. Like the ongoing reintroduction program in Wisconsin, captive-bred whooping cranes are released annually to Louisiana, in the hopes that they will survive, find a mate, and reproduce. Achieving success in all three takes some time, because whooping cranes are quite a long-lived bird, and juvenile cranes may wait years before settling on their lifelong mate and laying fertile eggs. However, on April 11 of this year, the first wild whooping crane chick hatched in Louisiana since 1939 made its triumphant entrance to the world! Named LW1-16, this little chick has thrived and is now over two months old. 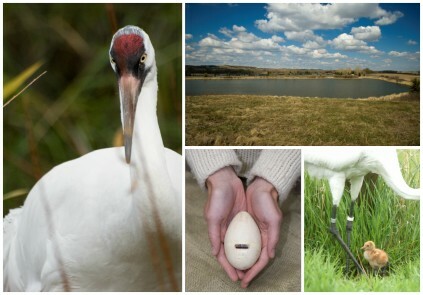 This history-making whooper has a strong connection to the Calgary Zoo – its mother, #L6-13, started life as an egg at our Devonian Wildlife Conservation Centre (DWCC), in the nest of our prolific and proud whooping crane pair, Nelson & Lancelot. Like many whooping cranes before her, L6-13 spent her precious first three weeks of incubation in the care of our captive cranes at the Calgary Zoo, and just prior to hatching, she took her first flight as an egg, in the Economy section of a commercial airplane! Accompanied by our experienced crane keeper, Valerie Edwards, and in the safe confines of a portable incubator, L6-13 flew from Calgary to Baltimore, Maryland in the spring of 2013. There, her care was transferred to the USGS Patuxent Wildlife Research Centre, where she hatched and was raised without ever laying eyes on a human being. Dedicated biologists in whooping crane costumes showed her how to find food, and encouraged her to run and swim and take flight, like a regular whooping crane. In December, she and other whooping cranes hatched that year were transported and released to their final home in the wild: Louisiana’s White Lake Conservation Area. The Calgary Zoo is the third-largest and only Canadian facility that breeds whooping cranes for release into the wild. We are proud to work closely with the U.S. and Canadian governments, and four other breeding facilities (Patuxent Wildlife Research Center, International Crane Foundation, Audubon Nature Institute, and San Antonio Zoo) in an international effort to restore whooping crane populations in the wild. Check back to our Facebook page to follow updates on LW1-16 and other our adorable “grandchicks”!